Dustopedia (Ghobar-Nameh/ غبارنامه) is an ongoing research, archive curatorial project which defined by New Media Society in response to an invitation by Anna Ptak, the curator based in Warsaw and meant to be exhibited in Warsaw in 2015 along with the project DUST/KURZ/غبار. It is an encyclopedia around the theme of dust, bringing together its appearance and reappearances of the subject through various media such as text, moving image, and found materials. Due to some problems and complications, Dustopedia wasn’t released during the exhibition, and the team decided to continue the project on their own and present it when another opportunity occurs in Iran. 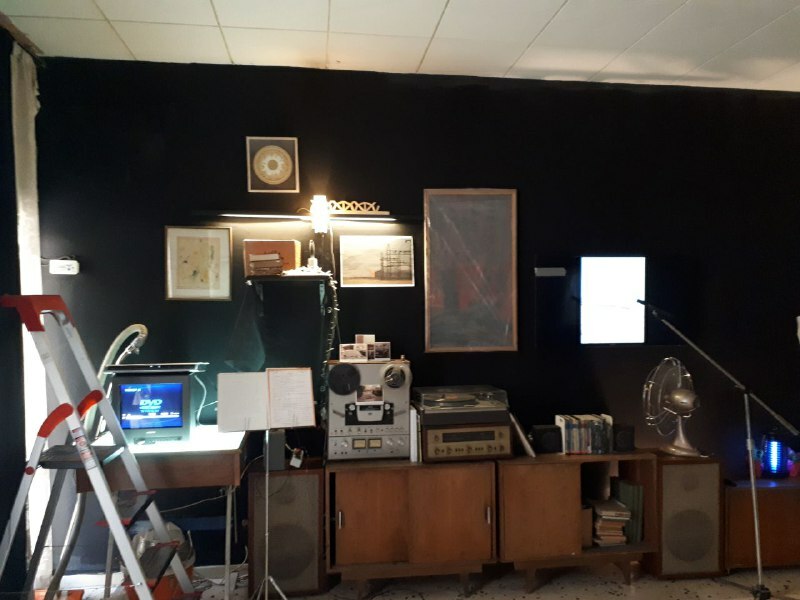 Meanwhile the archive was growing in many directions, and finally, in early 2018, New Media Society decided to dedicate its project space to Dustopedia for two months starting in April. The project is consist of an ever-changing wall installation, a study room and a screening area for talks and presentations. The subjects which are being researched are varying from representation of dust in documentary and feature films, work on paper, collecting News pieces and paper clippings regarding the micro-dust crisis and the environmental issues caused by the water shortage and drought to side effects of the wars in the region, as well as philosophical and metaphorical readings of dust in literature, poetry and film. The project invites the viewer to participate actively in the process by engaging in the conversation within various related disciplines and helping the archive by submitting materials and expanding the entries of the Dustopedia. The result is imagined in the format of an internet website and a possible publication. In association with the concept of dust this project tries to explore fundamental questions such as: what do we know about dust? Is it only floating/sitting matter or there are other layers/readings to this phenomenon? Are we cursed to dust up constantly, or just fribble away in comfort? What if we accept it as a condition/space which can initiate change? How the relationship between the center and the periphery, would be redrawn in accordance with the dust density and/or its inconsistency? How does it make reference to death, decay, and dissolving as the remanence of the once existed object? How does its ever-changing composition bring up coercion and exigency? Despite its popular definition, the word ‘dust’ can be taken as a signifier to separate the periphery from the center – as the place which the power is concentrated in and should be kept clear, pure and visible at any price; but the periphery, on the contrary, is a place/space for dust. It is always expelled/discarded to some remote places out of sight, dust will not attract any attention until it reaches the center. Maybe that’s why the outcasts and the forgotten are always associated with dust. Center is a place worthy of sweeping, hence dust and rubble are the largest export to the marginal territories; nobody bothers to sweep the periphery. Dust always gets on the news when it is too late – everywhere is filled with it. The Settled dust completes the process of opacity and hypocrisy, it devours the structures of power or transmutes them in itself. (9/11 and the 1st and the 2nd Persian Gulf War). The collected dust, on the other hand, refers to the archive, the analog and the history and all those nostalgias attached. Dustopedia is an encyclopedia with the capability for change, or the possibility of adding of new entries; archival/live entries of text, image, and film, toward various domains from scientific and ecological perspectives to rather abstract philosophical matters surrounding dust. Various portions of it get completed in the course of time and in the process of collective search and investigation. To separate these interconnecting matters, chapters and entries are designated to be filled with found objects/footages/text fragments, these entries – themselves – will be also capable of expansion.